European consumers expect a clean supply chain and biodiversity to be conserved. Therefore, reducing the inputs of pesticides and chemical fertilisers to a minimum and/or replacing them by agro-ecological or robot solutions is required. Furthermore, the average age of European farmers is among the highest of all sectors, thus farming needs to attract young people with attractive working opportunities. This is where the new agricultural robot solution for precision farming developed within the context of the EU Flourish (Aerial Data Collection and Analysis, and Automated Ground Intervention for Precision Farming) project can play a part. Use of robots in precision farming has the potential not only to increase yield, but also to reduce the reliance on fertilisers, herbicides and pesticides through selectively spraying individual plants or through weed removal. Precision farming combines technologies that customise the care that plants receive without increasing labour on the farmer's side. The project consortium targeted the development of innovative agriculture techniques by monitoring key indicators of crop health and targeting treatment only for plants or infested areas that require it. "Compared with conventional practices, precision farming techniques are much friendlier to the environment and bring more economic benefits," say project coordinator Prof. Roland Siegwart and researcher Dr Inkyu Sa. Given that most of the pesticides applied are herbicides to control the weeds, radically reducing the use of these chemicals and detecting parts of the crop field that are free of infestation will help to grow healthier crops. Development of precision farming techniques is a very active area of research, so the goal of Flourish was to bridge the gap between the current and desired capabilities of agricultural robots. 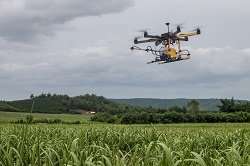 The project consortium developed an autonomous farming system where drones and robots work together to monitor the crop and precisely remove weeds. The newly developed robotic system combines the aerial survey capabilities of a small autonomous multi-copter unmanned aerial vehicle (UAV) with a multi-purpose unmanned ground vehicle (UGV). "Equipped with a camera, various sensors, GPS and statistical software the UAV can scan different crop characteristics such as height, canopy cover and chlorophyll levels, and provide information related to plant 'phenotyping'," explain Prof. Siegwart and Dr Inkyu Sa. The drone can also distinguish between crops and weeds, while advanced algorithms enable it to optimise its flight path. Once the UAV has completed its task it communicates the areas that need attention to the UGV. Utilising the data delivered from the UAV, the UGV prototype, called Bonirob, autonomously navigates its environment and performs actions at set locations. For example, it can spray a pesticide onto a selected crop area, and in the case of weed presence, it can get rid of them mechanically, avoiding the use of dangerous herbicides. Image recognition plays a key role in Bonirob's operation. Based on parameters such as plant colour, shape and size, the robot can help farmers classify plants more easily. Examining crop patterns alongside images, it can also differentiate more accurately between the desired plants and weeds even when their visual appearance changes significantly due to weather conditions or growth. Currently, Flourish members are working with end users to define product specifications and ensure that interests stay aligned. In addition, they are evaluating and optimising the newly developed system to make it more robust and easy to use with a short setup time. Project members are also trying to facilitate interoperability with other products on the market by utilising standard communication protocols such as the robot operating system. This will ensure minimal barriers to entry when the system is ready to enter the market. Technological advancements in farming such as those introduced by Flourish will enable farmers to minimise chemical use and produce healthier crops and higher yields. The system is also expected to reduce costs for farmers and minimise the environmental impact of crop farming.